These sugar cookies look like fluffy, über soft pillows, don’t they? Tonight I will have sweet dreams of sleeping on giant sugar cookies. My sister’s co-worker asked me for some special cookies for a baby shower. She was very specific with what she wanted. Sometimes very specific requests don’t work well, but this time it was perfect. 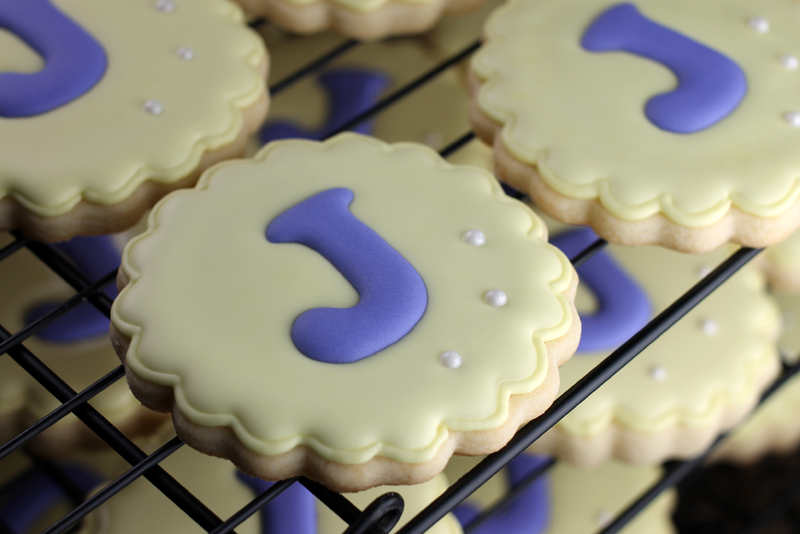 Karen, the co-worker, wanted (1) sugar cookies decorated with pale yellow icing, (2) a capital J in lavender, and (3) three lavender pearls on cookie. Ok, so I couldn’t find lavender pearls, but two out of three ain’t bad, right? 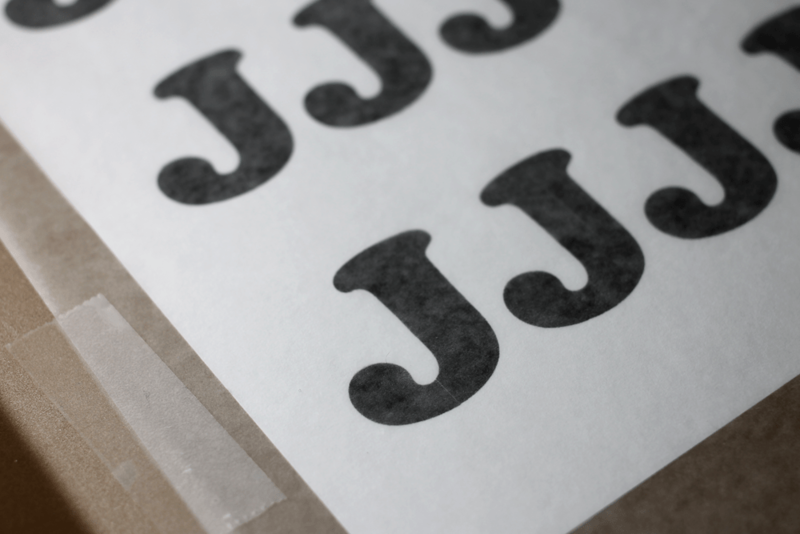 I found a great J and printed row after row of Js on a plain piece of paper. I did the same once before with these San Francisco Giants baseball cookies. This time I used a size #4 tip for the letters and it was perfect for these full figured, curvy Js. I also made some thinned out royal icing and tinted it lavender. It was thinned to the same consistency I would use to flood a cookie. Next step: Trace, trace, and trace some more. Reposition paper as needed. Trace, trace, and trace some more. These letters were left out overnight to dry completely. Since the J isn’t crazy detailed or delicate, I managed to get them all off the wax paper the next morning with no broken letters. Score one for me! Now comes phase two. You know, the actual cookie part of the sugar cookies. I first outlined each cookie with a pale yellow royal icing. The outline was left to dry for at least an hour. I’ve been known to be a wee bit impatient at this step, and have started flooding the cookies after maybe 15 minutes, but it’s resulted in lots of cracked outlines and frustration. It’s best to wait for the outline to dry for a bit longer. As soon as the cookie was flooded with the pale yellow icing, I placed a J in the center, and added the three mini white pearls. Voilà! The perfect party favor. These too should be left to dry overnight. If you try to touch/stack/bag them any sooner, you will forever regret it. 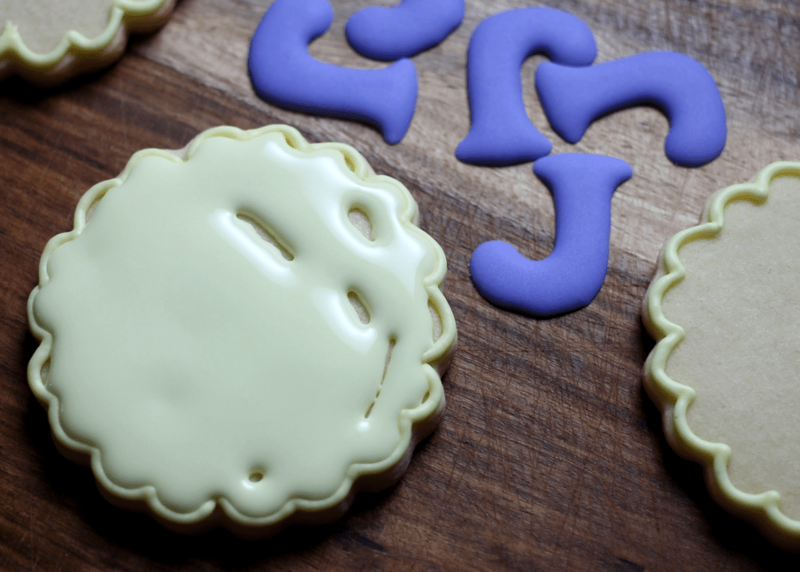 You can find a cookie cutter just like this one over on Etsy. These are so lovely!! Let’s talk orders soon!! I’ve been trying to figure out how to do lettering on a cookie. I’m doing a heart short bread cookie with a fancy letter in the center. I will try your technique and hope it works. My letter will be thinner and with swirls. You think it will work? I’ll give it a try. Thank you so much for sharing your idea. Hi Colleen! This technique works best when the letters are a bit fuller and don’t have a lot of detail. The royal icing is fragile, so I would be worried that details would not work as well, and you’d get a lot of broken pieces. For details like that, I would draw the letters directly onto the cookie itself. 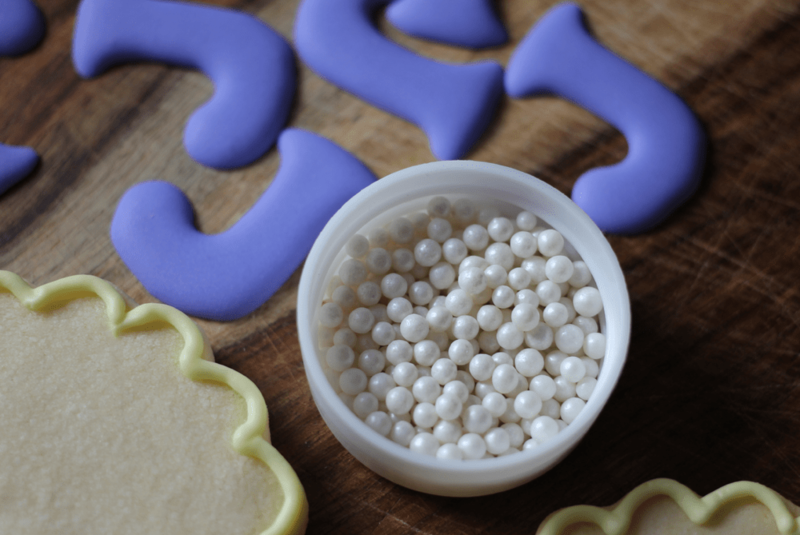 It might be helpful to use food coloring pens to place little dots as guidelines, then tracing your dots with your royal icing. The font used for these J’s was Cooper Black. I definitely have to try this technique! I’m always worried about the cookies getting stale if left out overnight to dry. How do you deal with that? What kinds of icing did you use? Also, what do you mean you thinned out the royal icing? How and what do you recommend/use to thin the icing for each part (i.e. – the letter, the pipping around the edge & the filler icing for inside the border)? Hi Hayley – All of the icing I use is royal icing. Whenever I need a slightly thinner consistency of icing for any reason, I slowly add a bit of water until I get the desired consistency. The borders of the cookies is a more stiff icing consistency. 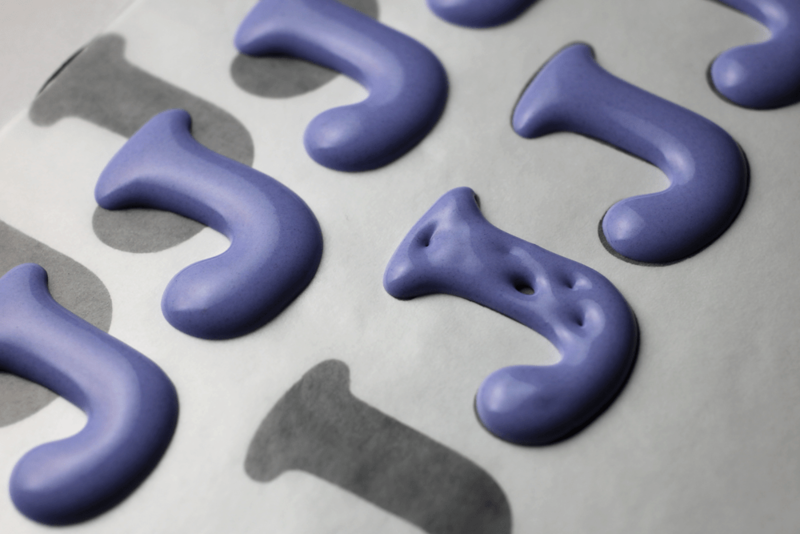 The letters and the surface of the cookie have the same consistency – something close to what is often called either 15 second icing. It’s when you can draw a knife through the surface of a bowl of icing and it’ll slowly settle to a level surface on its own in about 15 seconds. Can these cookies be frozen after decorating? Absolutely! Just make sure the cookies are completely dry and then you can layer them in ziplock bags. I then place the ziplock bags in a tupperware-type container so they have tough protection around them. To defrost, just leave them (still in the container and bags) at room temperature overnight. By the next day, they should be ready to enjoy. I didn’t know you could freeze iced cookies! That would be excellent for preparing loads of Christmas cookies ahead of time! I always thought the icing would get cloudy. These are lovely! I just started working with royal icing and love it! My question is, what paper did you use to trace on, parchment paper? Thank you very much for sharing your great tutorial! Hi Heidi – I use wax paper. Once the royal icing is completely dry, it releases the icing fairly easily. Many, many thanks for the details and descriptions. Excellent method and ideas. I was wondering what SIZE font did you use for the Copper Black? Hi Kimmy – the size of font you’ll want to use will depend on the size of cookie you want to place it on. For these here, the cookies measure about 3-inches in diameter and the font size I used was 150. Hope that helps! Can you share the sugar cookie recipe? Royal icing… Is that something you have to make, or is it sold anywhere? I am getting ideas together for an event coming up, and was in town familiarizing myself with my local options yesterday. I didn’t see anything called royal icing, but did see some Wilton brand cookie icing. I love dessert making and the decorating is my favorite part, but I’m still a total novice, as my desserts were most commonly cakes and pies. I am looking to make the sugar cookies with the wedding date on them, and maybe a wedding dress or wedding cake cookie. I could quite possibly be in over my head. 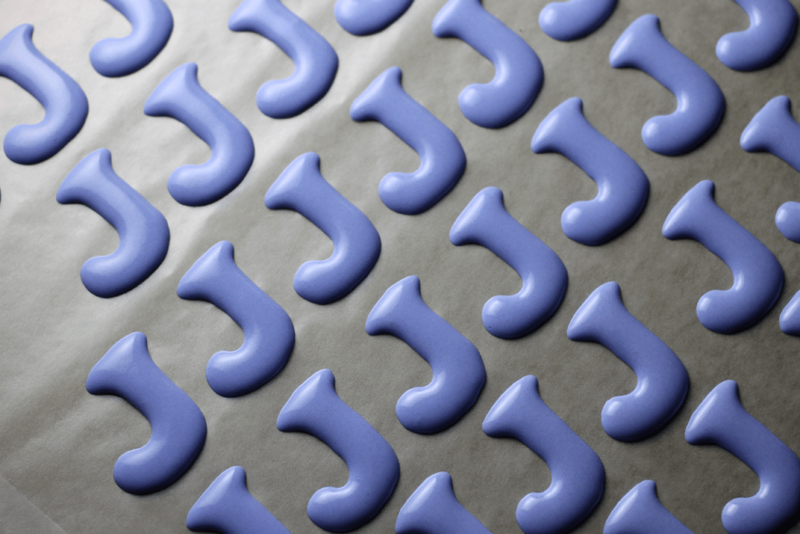 Royal icing is something that you would make to decorate your cookies. I unfortunately don’t have a tutorial for it, but there are lots available online. I would recommend a quick internet search so you can get more familiar with it. The short and sweet version of the recipe I use is this: 2 lbs powdered sugar, 1/2 cup meringue powder (available in bake supply shops), 1 cup water. Mix with an electric mixer for several minutes until desired icing consistency is achieved. Where did you get the cookie cutter at? I am having trouble finding a similar one. Hmm… I’ve had this one so long I really don’t remember where I bought it. I usually pick up random cookie cutters here and there if I see them. If you haven’t yet checked Easy.com, that could be a great resource. Good luck! I am going to attempt this. I tried to make bunnies but they all cracked and it was really hard to get them off the wax paper, I even put them in the freezer to help. 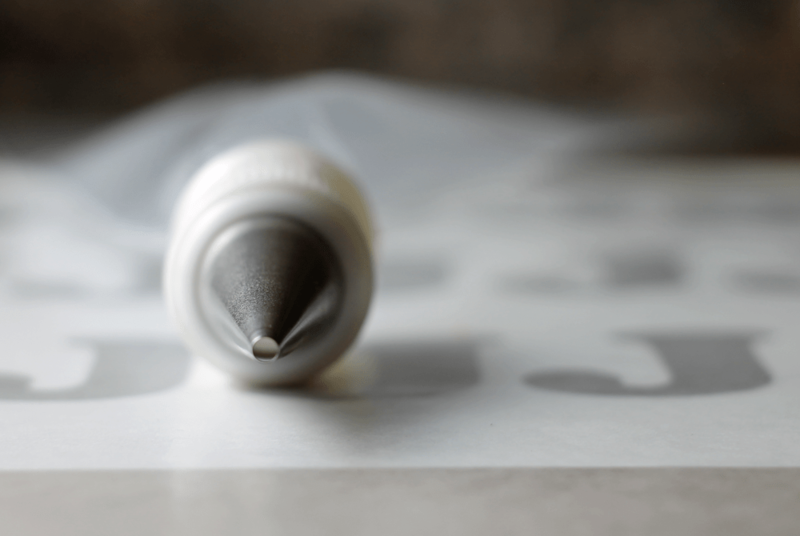 What is your royal icing recipe you use? Maybe that is the problem I have. I love this idea! Royal icing transfers can break easily, so you will have to make sure they’re dry and be super duper careful when removing. Any design with fine details tend to not work, so if you have solid pieces, that would work best. Also, make sure the royal icing isn’t spread too thin. The royal icing recipe I use is: 1 lb powdered sugar, 1/4 cup meringue powder, 1/2 cup water. Mix with a whisk attachment (there are many differing opinions on what attachment works best, but this works for me) until medium/stiff peaks form. I then use water to thin out to the desired consistency when needed. For transfers, it should be thicker than honey. Spreadable, but you’ll want it to keep its overall shape. Hope that helps! 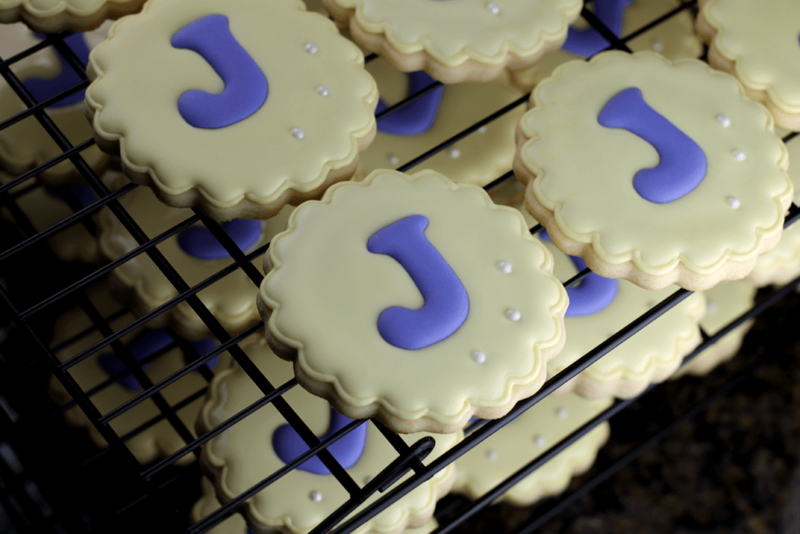 What recipe do you use for the royal icing for the letters and for flooding your cookies? Thankyou for this tutorial. I was wondering how far in advance you can make decorated sugar cookies (without freezing them)? I want to make some for my daughter’s birthday, but am a complete beginner so would prefer to do it as far in advance as possible in case disaster strikes. I have a shower I need cookies for. Do you have a price sheet? Please email me. Thank you .